Retail sales figures for October showed shoppers want their merchandise trendy or marked down -- and maybe even both. 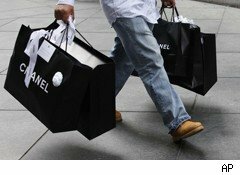 Consumers are still spending carefully, but are starting to move out from basics toward more fashionable clothing and extras, a good sign for the coming holiday shopping season, say analysts. Comparable sales (for stores open at least a year) were up 1.6% on average at major retailers in October, according to a tally by Thomson Reuters. Most retailers reported the month started slow and picked up strength in the second half, as the weather started to cool down, spurring more sales of fall clothing that had been depressed by unseasonable warmth in most of the country. The weather effect shows shoppers have an entrenched "buy now, wear now" mindset when shopping for non-essentials like clothing, noted Brian Sozzi, retail analyst at Wall Street Strategies. Most retail observers have noted that post-recession shoppers are buying closer to events such as back-to-school -- and sometimes after the start of the school year -- and are more event-driven. "Within that, the buy now, wear now product better be the snazziest-looking in the mall or offered at 30% off, or the retailer runs the risk of losing a ticket," Sozzi wrote in a note to investors. Consumers who have money to spend are shopping, but they are increasingly looking for trendy items and merchandise that can't be found everywhere, said Laura Gurski, partner at consulting firm AT Kearney. "These are individuals going out with discretionary income, picking up things that caught their eye," said Gurski. "October is about assortment, about what was hot in October." Results were mixed, with some strength at luxury retailers and strong traffic offsetting bargain shopping at discounters. Even Saks (SKS), which posted 8.1% growth, noted results were helped by the shift of an annual sale event from November last year. But management estimated sales would have still grown in the mid single-digit percentages without the sale. Store traffic remains strong and picking up, but shoppers are still spending carefully, and often spending less per trip. Both Target (TGT), which posted a disappointing 1.7% growth, and BJ's Wholesale Club (BJ), which had a healthier 3.7% increase, noted average transaction sizes partly offset rising store traffic. Kohl's (KSS), which had strong sales until recently, posted a 2.5% drop it blamed on lower average price per transaction that offset an increase in transactions in the mid single-digit percentages. Rival J.C. Penney (JCP), which was down 4.5% for the month, reported a similar pattern: Transactions and items per transaction were up, but prices were down, which it blamed partly on a highly promotional retail environment. After a strong performance over the last year, TJX Cos. (TJX) blamed the weather for flat October sales. Management noted that regions where unseasonable weather was not an issue were standouts, including Florida and the West Coast. The company restated its third-quarter guidance, saying it expects to come in on the upper end of its previous forecast of 89 to 91 cents per share. Some retailers saw enough strength going into the key holiday period to raise their earnings guidance. After posting sales growth of 9% in October, Victoria's Secret parent Limited Brands (LTD) projected it will post earnings of 15 cents to 17 cents per share in the third quarter, better than the 3 cents to 8 cents previously forecast. And Macy's (M), which posted growth of 2.5 percent, updated its forecast for the rest of the year; raising sales expectations for the second half to between 3.3 percent and 4 percent growth, from its previous forecast of 3 percent to 3.5 percent. That also triggered an upgrade in its earnings projections, to $1.50 to $1.55 per share during the second half, up from $1.45 to $1.50. As retailers head into the holiday season, promotional activity should pick up, said Gurski. But this holiday will be more about having the right products than about having just enough inventory to avoid big markdowns, as it was last year. Households savings are up, which means those who are still employed have more money available for non-essential purchases, she noted. "For those who do have money, this is the third recession holiday we're going through," said Gurski. "If they're going to spend their money, they will be spending it on items that are more interesting for them." So expect stores to be pushing exclusive merchandise and special-purchase items until the end of the year. "I still think you're going to see caution (regarding inventories)," said Gurski. "But the retailers will be more sophisticated. This is their third year of doing this."